Actor and filmmaker Robert Neal Marshall and IANDS Group Leader Yvonne Sneeden have teamed up to produce a documentary, Back From the Light, on near-death experience aftereffects that will include perspectives from the NDEr, the NDEr's family and NDE researchers. Both Robert and Yvonne are NDErs. The viewpoint of the family members of NDErs has not been covered much in the NDE literature or film. The latest IANDS Conference in Newport Beach, California was a fun and informative affair that attracted a lot of attention from the attendees and from the media! The intriguing nature of this conference caught the interest of the Epoch Times reporter Tara MacIsaac who covered the sessions in detail! The Epoch Times provided a complete section on the conference including 10 articles. Each article provides insight into the nature of Near Death Experiences and a wonderful review of the presentations. Learn more about the conference and read each article by clicking the READ MORE link below. The Epoch Times covered the IANDS Conference in Newport Beach, California in detail. These are a few of the most intriguing quotes recorded at the conference. "...eventually, continuity of life will be as simple as the seasons... spring, summer, winter, fall... life, death, afterlife, and rebirth." -Dr. Jim Kwako, M.D. See all of the quotes and read more about the conference by clicking here. In early April, representatives from IANDS joined the Rhine Research Center in a joint presentation discussing the nature of Near-Death Experiences. 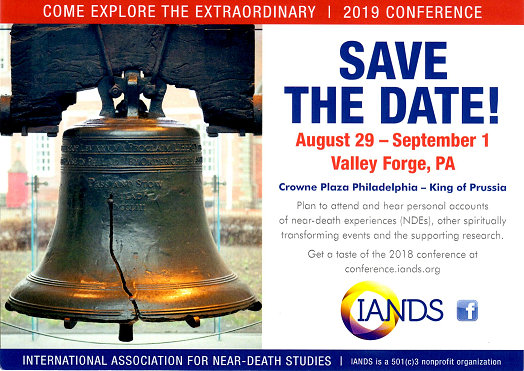 The discussions included a presentation by NDE researcher Robert Mays on the nature of NDEs and three remarkable presentations by NDE experiencers. The educational night provided a nice introduction to the NDE experience and fascinated the crowd with an in-depth descriptions of NDEs and the life-changing effects they had on the panel members. Click here to view a video of this unique and important presentation on the Rhine website. An article in the Austin American Statesman from September 1, 2014 describes the near-death experiences of Pat Johnson while he was kayaking on the Blanco River. Johnson was with a friend when the kayak tipped over and he was trapped underwater for a number of minutes. During this time Johnson had a near-death experience where he saw light streaming through a stained-glass window and he was surrounded by "multitudes of souls". He felt overwhelming love, forgiveness and peace. When he was revived, Johnson searched for answers and found IANDS. His experience drew him to help others who had similar experiences, and he now leads the Central Texas Chapter of IANDS in Austin. In mid-June, the Chou Ta-kuan Cultural and Educational Foundation sponsored an information and educational meeting to encourage Taiwanese people who have had Near-Death Experiences to come forward and share their experiences. Established in 2002, this center has encouraged the recognition and awareness of NDEs in Taiwan. According to Lin Keng-hsin, a psychiatrist at the center, people who experience NDEs "began to love life and nature passionately, and suddenly adopted simple diets, respected the environment, took to helping people, advocated environmental protection and put a higher priority on their spiritual sides." Click here to see the full article and to learn more about this new center in Taiwan. In 1962, Nancy Clark was in the midst of a difficult childbirth when she left her body and found herself in the presence of a soothing and calming light. Her near death experience was profound, but she did not find the words to speak about it until she read Raymond Moody's Life after Life in 1976. Nancy has since become a group leader for an IANDS group in Ohio. This story and other stories of near death experiences are being featured in a week long segment on Cleveland's Fox 8 News. You can see stories of Nancy's NDE and Howard Storm's distressing NDE by watching Fox 8 or viewing the videos of the segments on the Fox 8 website. Archive of all stories. Edgar Cayce's life was punctuated with remarkable experiences. He spent years fascinating the public and producing thousands of recorded cases of readings and healings. Cayce would enter an altered state and communicate with non-physical entities who spoke through him providing information and guidance. His talents and abilities are legendary, and now there is evidence that Cayce had an NDE while a child. Neil Helm, Scholar in Residence at Atlantic University at the Association for Research and Enlightenment in Virginia Beach has found evidence in the archives that Edgar Cayce drown and was pronounced dead at the age of 5. He was revived but kept his experience a secret for many years. Helm writes about this experience and his exploration of the Cayce Vault in the April through June Issue of Venture Inward in the article Did Edgar Cayce have a Near Death Experience (pp. 44-46). Lynnclaire Dennis had a Near Death Experience in 1987 after an accident in a hot air balloon. The experience included the vision of a "beautiful and loving light" that she instinctively recognized as the pattern of all life. Though many NDEs include the vision of a light, this one was different. In a life review during the NDE, Lynnclaire was informed of her mission in life. Lynnclaire returned to the physical world with a mission to recall and understand the perfect pattern that she encountered in the light. For years, Lynneclaire explored the patterns in this light using lucid dreams, visions, among other techniques. The pattern caught the attention of mathematicians and scientists, and the Mereon Matrix is now a topic of academic study. You can read a complete description of her amazing journey here. Do Children Really Have NDEs? Dr Oz Program Asks - NDEs Are They Real? Science Channel: Is There Life After Death?